A snapshot from LUASOSE. Bonzai Buddy is telling of piloting Japanese Zeros into the American battleships. 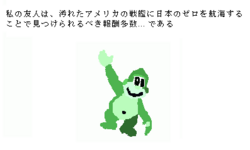 The Bonzai Buddy, not to be confused with its Bonzi Buddy, was a cartoon character in the educational 1940s Japanese children's television program Let Us All Sacrifice Ourselves in Service to the Emperor. Every week, the Buddy would prance onscreen and extol the virtues of piloting a fully armed and fueled Japanese Zero into the battleships of the filthy Americans. The next segment would have the Bonzai Buddy leading a group song in which the divinity of the Emperor was duly noted. After that came the Western Defilement Game, which involved burning the effigies of various Allied leaders or soiling the American flag. The program would then come to an end while all the children in the studio audience were forcibly drafted into the Imperial Army. The Bonzai Buddy and the rest of the program saw a steep decline in popularity following the U.S. atomic bombings, and were off the air in Japan by 1946. After the bonzia monkey walked the baton death march, he killed himself. then came back to life. In August 1946, Bonzai Buddy appeared abroad in a series of short animated plays (see also: Cartoon) by Fat Ibsen alongside other animated classics such as Walt Disney and the Power Rangers. Since then, Bonzai Buddy is rumoured to have taken up a casual cocaine habit and has run for president of Canada twice. This page was last edited on 13 August 2012, at 08:20.